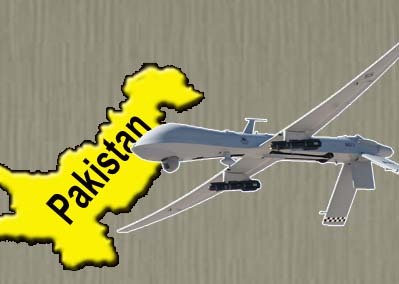 Can Pakistan Stop Drone Attacks? An Arabic folktale, The 18th Camel, might be extremely instructive and useful for Pakistani foreign policy and defense managers and decision makers to deal with conflict management and its resolution regarding the US drone attacks on Pakistani territory, an explicit violation of its national sovereignty. It is an extremely important issue because the drone strikes have killed hundreds and thousands of innocent Pakistani citizens and have brought the country to the absolute edge of political, social, economic and cultural destruction. “There was a father who left 17 camels as the inheritance for his three sons. When the father passed away, his sons opened up the will. The Will of the father stated that the eldest son should get half of 17 camels while the middle son should be given one-third. The youngest son should be given one-ninth of the 17 camels. Half of 18 = 9. So he gave the eldest son 9 camels. 1/3rd of 18 = 6. So he gave the middle son 6 camels. 1/9th of 18 = 2. So he gave the youngest son 2 camels. 9 camels plus 6 plus 2 is 17, and this leaves one camel, which the wise man took away. Hence, the imperative question here is: Does the incoming political administration of Mian Nawaz Sharif truly believe that there is a possible solution to US drone strikes on Pakistan? Does the incoming regime in Islamabad want the drone strikes to end immediately? Are the incoming civilian leadership and the present day military establishment in Pakistan in absolute agreement for a unified strategic approach to engage with the US to finally end drone attacks on Pakistani territory? Have the PML-N leadership and incumbent military commanders devised an appropriate method of engagement with the US on this vital issue? Does Pakistan have the kind of negotiation edge to make the Americans carefully pay attention and listen to this country’s perspective on the drone issue? Can the new democratic regime negotiate with the Americans from a position of strength? Is the Pakistani civilian-military leadership on the same page to deal effectively with the US belligerent drone policy towards Pakistani? The problem is that politics in general and foreign policy-making in Pakistan, specifically when it comes to dealing with the US, has always been secretive and evasive, and made purely on an ad hoc basis. We want more money. They want us “to do more” in the service of their global and ideological objectives. We have always been willing to play a subservient role; they have always succeeded in their demands. We have always played weak; they always prevail. We have always made ourselves inherently dependent on them; they always act from a position of strength. For decades our successive governments have never taken its citizens into confidence on the issues of foreign policy and the fundamentals of our engagement with the US. On the other hand, the Americans prepare massive domestic public support for their political military strategies against foreign countries. Indeed, the incoming Pakistani Prime Minister has strongly condemned the Obama Administration’s recent drone attack that killed an important Taliban leader in Pakistan: “The drone attack was not only a violation of the country’s sovereignty and territorial integrity but an action that has been declared a violation of international law and the UN charter,” said Mian Nawaz Sharif. Well done, Prime Minister – but a part of your statement is alarming: “Obama…claimed to exercise care and caution while using this technology.” Does this statement mean a drone strike is justified when some kind of “care and caution” is applied? What does “care and caution” exactly mean in the context of an overall Pakistani strategic and policy approach to drone attacks on Pakistan’s territory and its citizens? Is the incoming Prime Minister’s above-mentioned statement for public consumption and a part of public diplomacy? Can the PM’s statement restore this nation’s public confidence in the incoming government’s seriousness and resolve in stopping drone attacks? It is imperative to understand the political behavior of all players involved in a conflict situation. Let us admit some basic facts: The US is a deadly adversary. It always negotiates from a position of strength. It gives and carries out credible threats. It has a financial and military edge in most of its international conflict negotiations. It has the capacity to engage in dangerous and destructive military interventions, both overt and covert, in pursuit of its policy objectives. It takes unilateral decisions in dealing with its adversaries and has the political –diplomatic leverage to influence global institutions such as the UN, the Security Council and other international financial institutions. The US is a wild horse on the loose – its friendship is as lethal as its enmity. On the other hand, Pakistan’s 6-decade history of civilian- military leadership has been categorically complacent in its foreign policy approach towards American global agendas. Starting from the US anti-communist crusades to the most recent anti-terrorism war and the camouflaged anti-Islamic global initiatives, the Pakistani political elite and military rulers have always been on the page where the Americans have dictated them to be. Now the US 21st century foreign policy objectives are to enroll Pakistan in its containment of China policy and in strengthening American political-military-commercial interests all over the Central Asian and South Asian region. Pakistan’s political weakness during the last 6 decades has been its civilian-military leadership which has always been willing to subjugate this nation’s interests to their personal vested interests – both political and economic. Can the incoming Pakistan civilian leadership change its political discourse and engage America in a different manner? Can the Sharif regime in Islamabad take the entire nation in confidence and postulate a nationalist strategic approach vis-à-vis the Americans to shift Pak-US relations to a new direction? We can stop drone strikes on our territory on our own conditions. We can negotiate from a position of strength if we have fully understood American political behavior – and if our own political-military establishment can come on the same page willing to negotiate for Pakistan’s national interests above and beyond their own institutional and personal vested interests. Let us start with the most important fact: The American policy-makers only understand the language of power. To begin with, the incoming administration in Islamabad, with the collaboration of all political parties, should arrange massive million people marches and demonstrations all over the country in a show of national solidarity against drone strikes. Imran Khan’s role in this kind of political strategy becomes paramount and should be acknowledged as such. Secondly, let us put our cards on the table about our explicit conditions for the US forces’ safe exit from Afghanistan via Pakistan. For this, Pakistan’s political establishment would need an articulate and determined team of experts, historically knowledgeable of US foreign policy and linguistically expressive in English, and who have never been in a subservient role to the US, to negotiate with the Americans. Let us be assertive. Let us assure Obama of the US forces safe exit next year on our conditions – which are based on 3 primary demands: 1) end drone strikes immediately, 2) arrange an immediate political reconciliation with the Taliban, both in Pakistan and Afghanistan, and 3) immediately stop the so-called war on terrorism on Pakistan and Afghanistan territories. Indeed, it is an extremely complex process, and yet a “Constructive Conflict Engagement” with the US is the only way out of this quagmire. Do we believe in the 18th camel solution? Let us give political solutions a fair chance over the use of military force – and the dictates of a superpower! For once, let us stand for people’s rights. Let us stand for humanitarian principles rather than for political expediency! More on the said process in the next column.